Trindade is a small, deserted, rocky island located in the middle of the South Atlantic Ocean, between the Brazilian coast and the African continent, more than six hundred miles off the coast of Bahia. During World War II, it was used as a military base for United States and Brazilian warships engaging German U-boats. It was abandoned after the end of the war, remaining completely deserted and forgotten until 1957. In October of that year a task force from the Brazilian Navy arrived there, under the command of Captain-of-Corvette Carlos Alberto Bacellar. The Hydrography and Navigation Division of the Ministry of the Navy had decided to build an oceanographic post and a meteorological station on the island for research connected with the International Geophysical Year (IGY). In early January 1958 the ship "Almirante Saldanha" left Rio de Janeiro's harbor and proceeded toward the Island of Trindade with a crew of three hundred. The ship had previously been a Brazilian Navy training vessel, but it had been converted into a hydrographic unit to be used for IGY-related research. It was operated by the Hydrography and Navigation Division, and, since October 1957, it had made several trips to Trindade, most of them connected with the Navy's oceanographic studies for the IGY. Several civilians were aboard the ship this time, officially invited to collaborate in the scientific studies which were underway at the island. One of these men was Almiro Barauna, a photographer and former newspaperman working as a "free-lancer." He was also an expert in submarine photography. After a routine trip, the ship arrived at the Island and stayed there for several days. It was scheduled to leave for Rio on January 16. On that day, at 12:15 P.M., when the ship was preparing to depart, a strange object was sighted simultaneously by a number of observers gathered on deck. The UFO came toward the island at high speed, hovered briefly over a peak, disappeared behind it for a short time, and appeared again to move away toward the sea. Mr. Barauna was taking pictures of the ship's maneuvers at that moment. He spotted the UFO and got four pictures of it. Q. Mr. Barauna, what were the reasons for your presence aboard the NE Almirante Saldanha? Amilar Yieira Filho, captain of our team, a government employee (he has a job at the CACEX); Jose Teobaldo Viegas, instructor at the Aero Club of Niteroi and Air Force captain (retired); Mauro Andrade, from the London Bank; and Aloisio, municipal employee at the Federal District. We were going to try to beat some records on submarine hunting. Personally, I was going to take underwater photographs for the Navy and, also, to write some articles about the Island and the activities of the scientists working for the IGY. Q. Were any other civilians aboard, besides your group? A. Yes. There was Professor Fernando, a geologist, with two assistants, and also a photographer, and a reporter from the newspaper Jornal do Brasil. The three scientists left the ship and went to the island. "Q. Please tell me what was the date of the sighting? What happened? A. It was on January 16, at 12:15 P.M. The ship was preparing to leave the island, to come back to Rio. I was on the deck observing the operations to take aboard the boat used in the trips between the ship and the island (the island has no harbor). The sea was agitated. The weather was cloudy, clear, with no shadows. I had my Rolleiflex 2.8, Model E, which was kept inside an aluminum box for protection against the corrosive effects of water and salt. I had left my Leica with a telephoto lens in my cabin a few moments before. The deck was full of sailors and officers. Suddenly, Mr. Amilar Vieira and Captain Viegas called me, pointing to a certain spot in the sky and yelling about a bright object which was approaching the island. At this same moment, when I was still trying to see what it was, Lieutenant Homero, the ship's dentist, came from the bow toward us, running, pointing out to the sky and also yelling about an object he was sighting. He was so disturbed and excited that he almost fell down after colliding with a cable. Then I was finally able to locate the object, by the flash (of light) it emitted. It was already close to the island. It glittered at certain moments, perhaps changing its own light - I don't know. It was coming over the sea, moving toward the point called the Galo Crest. I had lost thirty seconds looking for the object, but the camera was already in my hands, ready, when I sighted it clearly silhouetted against the clouds. I shot two photos before it disappeared behind the peak Desejado. My camera was set at a speed of 125 [125th of a second], with the aperture at f/8, and this was the cause of an overexposure error, as I discovered later. In the confusion produced as a result of the sighting, I was being pulled and pushed by other persons also trying to spot the object and, as a consequence, photographed the sea and the island only - not the object. It was moving out to sea again, in the direction from which it had come, and it appeared to stop in midair for a brief time. At that moment I shot my last photo (the last on the film). After about ten seconds, the object continued to increase its distance from the ship, gradually diminishing in size and finally disappearing into the horizon. Q. Did you hear anything unusual during the sighting? Was the object emitting any sound? A. I am not sure, to be honest, because of the noise made by the sea waves against the island's rocks, as well as for the yelling aboard the ship at the time. However, I think that I heard nothing besides those sounds. Q. What was the color of the object? A. It showed a dark gray color, appearing to be surrounded - mostly in the area ahead of it - by a kind of condensation of a greenish, phosphorescent vapor (or mist). Q. Did the object appear to be metallic? A. Yes. It was obviously a solid object. Q. How was it flying? Any special characteristics? A. Yes. It showed an undulatory movement as it flew across the sky, like the flight of a bat. And when it came back, it changed speed abruptly, with no transition, in a jump. Q. Do you know how many persons aboard the Almirante Saldanha sighted the object? A. 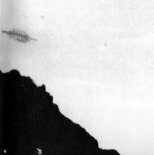 The object was sighted by almost all the people on the deck at that time, including Lieutenant Homero, Captain Viegas, and Mr. Amilar Vieira. Q. What happened after the sighting? A. The ship's commander and several officers from the garrison wanted to see what I had got in the photos. As I was very curious too, I decided to develop the exposed film at once, aboard the ship. The processing was done under the supervision of several officers, including Commander Carlos A. Bacellar. But only the negatives were seen aboard. The reason: There was no photographic paper for the copies on the ship at that time. The negatives, however, were seen and examined by the whole crew. Q. Did you keep the negatives in your hands? Q. Were you under any pressure to give up those negatives to Naval authorities? A. No. Commander Saldanha da Gama (the ship's CO) and the other Navy officers aboard were very kind. They never tried to get the negatives from me. Q. What happened when the ship came back to Rio? A. The ship stopped first at Vitoria, in the State of Espirito Santo. As it was going to stay there for two days and later travel to Rio, we were permitted - the civilians from the submarine-hunting group only - to leave the ship there and to take a bus for the rest of the trip. Later, two days after the arrival of the Almirante Saldanha at Rio, Commander Bacellar (ex-commander of the Navy Post at Trindade) appeared at my residence. He wanted to see the enlargements made from the negatives and asked permission to take them to the Naval authorities. Two days later, they were returned with congratulations. I was also requested to appear at the Navy Ministry as soon as possible. They wanted to ask me certain questions and to see the negatives again. Q. And what happened there? A. I was interviewed by several high-staff officers, who asked me all kinds of questions. I went there twice. At the first meeting, they requested the negatives for examination. They were sent to a civilian organization, the Cruzeiro do Sul Aerophoto grammetric Service, remaining there for four days. I was told by the Navy officers that the analyses proved they were genuine -excluding definitely the possibility of a trick or falsification. On the second visit, they performed several time-tests. While I worked with my Rolleiflex, taking shots at the same time intervals I had used to photograph the object, three Navy officers with chronometers registered the times. They came to the conclusion - based on these tests as well as on studies concerning the ship's position and examinations of charts of the island - that the object was flying at a speed between 900 and 1,000 km./hour [about 600 mph]. The object's size was also estimated on the basis of studies related with the island's details also appearing on the photos, diagrams drawn on charts, graphs, et cetera. The object was about 120 feet in diameter and about 24 feet high. Q. Do you know anything about the official report on the case? A. I saw a dossier which was consulted many times during the interrogation. However, I didn't read what was written there. I was also informed that my photos, mixed with other pictures, had been shown to witnesses of the sighting - to be identified. The result was positive. Q. Do you know anything about any photos by other people aboard the ship? A. No. Besides myself, there were at least four other persons with cameras at the time of the sighting. But apparently they were not able to spot the object in time, or were paralyzed by their emotions. Q. Were you warned against something by the Navy's authorities? Was there some recommendation? A. Yes. They requested me to keep the matter secret for some time. I was permitted to publish the case only after authorization from the Navy. The permission was granted, verbally, on the night of February 15, by Commander Bacellar. They made only one restriction, which I cannot mention for the reason that I have given my word. Q. Do you know if your sighting was the first over the Island of Trindade? A. I was informed of four other sightings over the island during those thirty days preceding the incident of January 16. I was also informed of another thing: At one of those sightings, the object was photographed by a Navy sergeant. His photo obviously was not released and probably never will be - the reasons are evident. Besides those four sightings, there was also the RADAR case. A target flying at supersonic speed was tracked by the radar of the Almirante Saldanha on January 15. Q. Did you receive any money from the Navy for your work at the Island of Trindade? A. No. I was there as a guest. Q. Did you receive any money from the Navy for your photographic work, or for the enlargements you made for them? A. No. I only received the photographic paper to be used for enlargements. Q. How many enlargements have you given them. Q. One last question: What kind of impression did you get from observing the flying saucer? A. I am absolutely sure it was a controlled object - either directly or by remote control - but very well operated, in any case. The general impression of people aboard the ship was the same: It had come to make a close observation of the ship. Immediately following the publication of the photographs, the Brazilian Navy refused to make any official statement confirming or denying the incident. However, proofs from the original negatives were sent to the other armed forces and to Brazilian President Kubitschek. According to the press, the narration so impressed Mr. Kubitschek that he became convinced of the veracity of the happening. On February 24, three days after the photos were first published in the press, the Ministry of the Navy finally made the following official statement: "With reference to the reports appearing in the press that the Navy is opposed to divulge the facts concerning the appearance of a strange object over Trindade Island, this Cabinet declares that such information has no basis. This Ministry has no motive to impede the release of photographs of the referred-to object, taken by Mr. Almiro Barauna, who was at Trindade Island at the invitation of the Navy, and in the presence of a large number of the crew of Almirante Saldanha from whose deck the photographs were taken. Clearly, this Ministry will not be able to make any pronouncement concerning the object seen, because the photographs do not constitute sufficient proof for such purpose." On the morning after the photos of the flying saucer were published in the press (February 22), the Almirante Saldanha departed Rio to continue its mission in connection with the IGY. Two days later, however, the ship docked at Santos (February 24) for voyage repairs; this was the first chance that newspapermen had an opportunity to interview officers and men aboard. The U.S. Assistant Naval Attache' was in Santos at this time, in connection with the visit of U. S. Coast Guard Cutter Westwind, and had an opportunity to visit aboard. The commanding officer, Capitao-de-Mar-e-Guerra (Captain) Jose Santos Saldanha da Gama, had not seen the object and was noncommittal. The executive officer also had not seen it but, arriving shortly thereafter, had formed the opinion that those on deck had seen it. The captain had reported that his secretary, a lieutenant commander, had seen it, but this officer, when personally questioned, avoided discussing the matter. Later, it was learned that the photographer was accompanied to the dark room by an officer who waited outside the door while Barauna developed the negatives alone. When the Westwind's commanding officer paid a visit to the Almirante Saldanha, Captain Saldanha da Gama freely discussed the flying saucer incident and showed the original proofs to the callers, but again did not commit himself. Federal Deputy Sergio Magalhaes sent a note to the Ministry of the Navy on February 27, protesting the Navy's failure to secure sworn statements from witnesses. "For the first time in flying saucer history, the phenomenon was attended by large numbers of persons belonging to a military force, which gives these photographs an official stamp. Threats to national security require greater official attention and action," said the deputy. 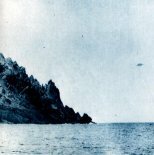 In the middle of all the publicity, other sighting reports came to light, including one by a naval officer who saw a UFO a month before the sighting from the Almirante Saldanha, off the coast of Espirito Santo. The commanding officer and crew of the Ata Tridente had seen a UFO several days before the Saldanha episode, but had kept the in formation secret.